Once my boys tasted Japanese Teriyaki Noodles, they forgot about their favorite boxed after school snack of Mac and Cheese and this became a family favorite. Now it’s commonly served with sautéed veggies or in a noodle bowl with chicken or steak. 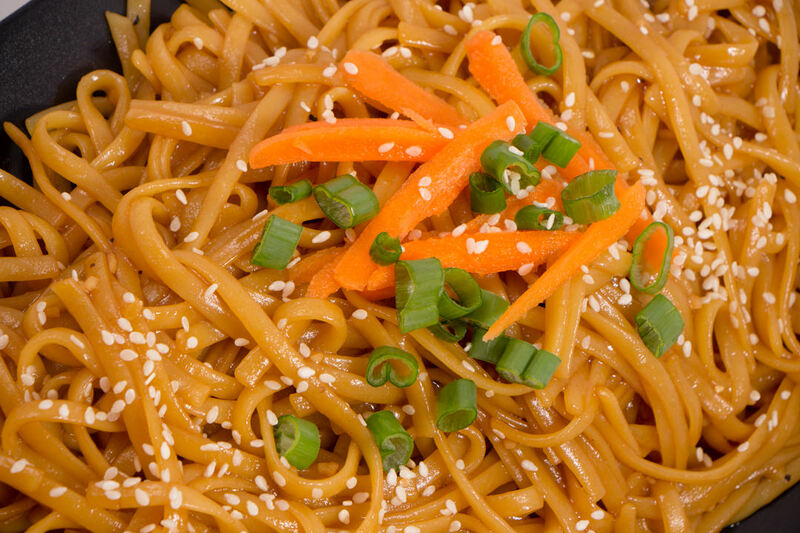 Teriyaki Noodles are tangy, sweet, and delicious. Use a bottled Teriyaki Sauce or follow my 10 minute Teriyaki Sauce recipe. You are sure to love these noodles. Delicious! 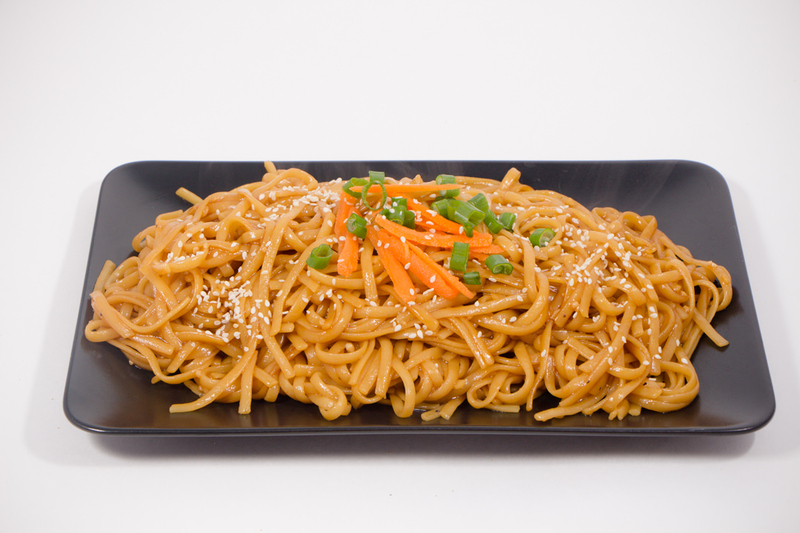 In the time it takes to make a box of Mac and Cheese, you can make this fresh Teriyaki Noodle. Follow the directions on your noodle package and rinse and drain the noodles when they are cooked. Then in a frying pan over medium/high heat, heat up 2 tablespoons of Olive Oil. When the oil is hot add the noodles and stir. You will hear the sizzle. Isn’t it wonderful? Add the teriyaki sauce and stir to coat all the noodles. You can always add more or less depending on how sweet of a flavor you want. Sometimes I even add some sliced onions and slivered carrots at this point but it’s truly optional to what you prefer. Let this cook for 2-4 minutes. The Teriyaki Sauce will bubble and caramelize a bit. Sprinkle ginger on top and get ready to serve. It’s just that simple. Garnish with sesame seeds, green onions, and carrot slivers. 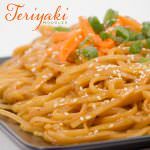 Serve Teriyaki Noodles as a side dish or in a meal. Add chicken, pork or steak and of course vegetables to this wonderful flavorful dish. You can’t go wrong. Make a Noodle Bowl with your favorite fresh ingredients. You will feel like you went out to eat with the luxury of staying in. 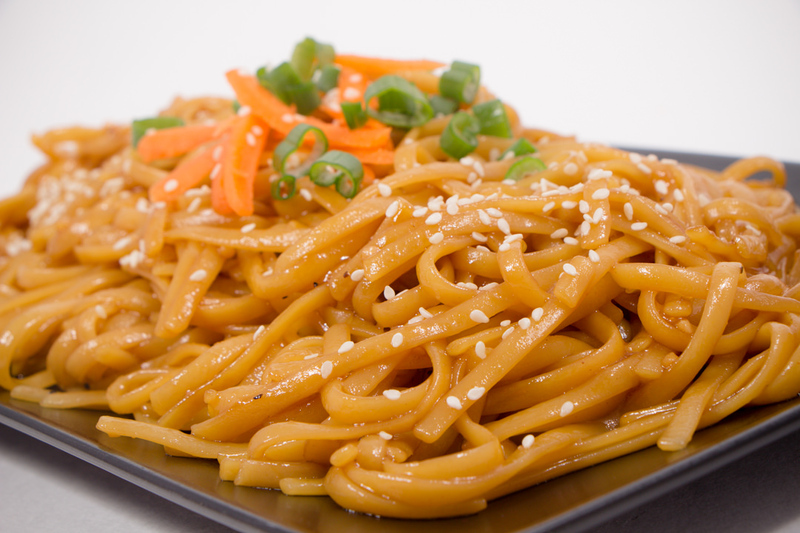 Sweet Tangy Teriyaki Noodles. If you have ever had these from a Japanese Hibachi, then you know how good this recipe will be. Perfect combination of flavors. Cook noodles according to directions. Rinse and drain. In large frying pan over medium/high heat - heat 1-2 tablespoons olive oil. When hot, add rinsed and drained noodles. Stir. Add Teriyaki Sauce and stir. Cook for 2-4 minutes. Sprinkle Ginger over top and stir. That sounds so good and the directions are really easy! these look awesome! have you heard of shirataki noodles? im going to try this with those! Looks delicious. As a side or with protein for a meal. This is among my sons favorites! that’s way too easy! haha. now just need a protein and side for a complete meal. It’s super easy to add veggies and chicken, steak or pork to this and have a complete meal. We love it! I have never thought of this. What a great idea to add some variety. It’s unique but so fun and my boys love it. Added to my Dinner Ideas Pinterest board! 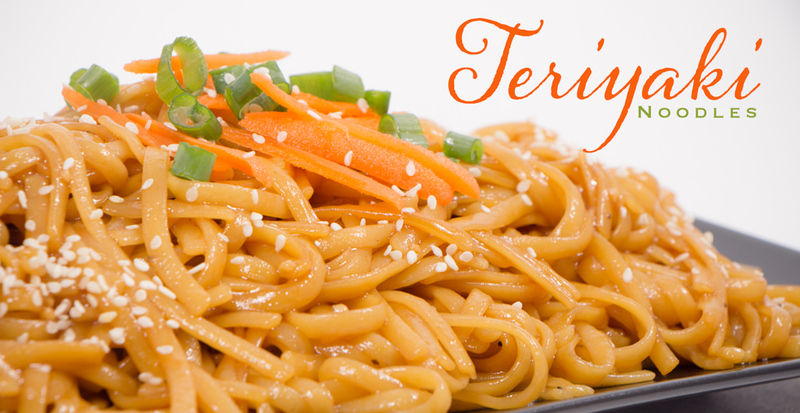 My kids and I love teriyaki – my husband not so much, but we can make him another kind of noodles instead! 😉 Thanks for sharing! There is always one who wants something different! That’s okay, if you serve the noodles with veggies, you can just serve plain noodles with veggies for your hubby! Easy! Enjoy. I LOVE new recipes and will try anything new! I have never made something like this before….I will have to try! Is it crazy I’ve never seen this before? I’ve seen teriyaki chicken, but not the noodles! Looks good, though! They look delicious! This is one dish I have never even tried! These look delicious and super easy to make! I’m definitely going to be adding this into my rotation. I love the recipes that you shared to pair with it as well – definitely makes meal planning easier! Thank you so much for sharing! That’s looks so delicious and unbelievably easy! I’m definitely going to try this quick recipe at home. I would add some more veggies to mine for sure. Yum! Yum! I usually eat these type noodles “out,” but what a great recipe to pair with chicken and veggies! Combine this recipe with the teriyaki sauce recipe, and we are all set! Pinned!